If I had to pick a movie that reminds me of where I grew up it would be Martin Scorsese's Goodfellas; a film which chronicles mobster life in New York City. Though not connected to the mob, I did grow up in an Italian American neighborhood in Philadelphia similar to the one depicted in the film. Family was important, as was food and of course being Italian. With this year being the 25th Anniversary of Goodfellas, I decided it was time to watch the movie again. In planning I came up with the idea of "A Dinner In A Movie;" basically an excuse to have friends over and recreate a classic food scene from a favorite film. I decided to recreate the prison dinner scene in Goodfellas...right down to the translucent garlic cut with a razor blade. For those that don't know this movie the prison meal is a classic Italian American feast that the mob boys cooked up while doing time behind bars. Even if you haven't seen the movie, though I highly suggest you do, this pasta is perfect for feeding a crowd. The recipe below was adapted from Dave Watts, head chef at The Cotswold House Hotel. It may not be the exact recipe used in the movie but it certainly reminded me of countless meals I ate growing up. Is there "A Dinner In A Movie" you would like to see me recreate? Leave a comment below and let me know. In a large frying pan, over high heat add oil and fry both the ground beef and pork in separate batches, ensure your pan is really hot to get a good color on all of your meat. Drain each batch of meat into a colander, over a bowl to catch any juices. Heat olive oil in a large pan over medium heat, add diced onion and a teaspoon of salt. Cover with a tight-fitting lid and turn down to a medium low heat, stirring it every three to five minutes. Keep cooking this until the onions are completely soft and translucent. This will take around 25 – 30 minutes. Once you have fried your last batch of meat, place it all back into a pan over medium heat and add your finely sliced garlic. Cook this for 1 to 2 minutes, until the garlic starts to break down. Now add the white wine, boil and reduce to almost nothing, then add the stock. Turn your heat up high and continue cooking until the liquid is reduced by half. Add your canned tomatoes stir and place the lid back onto the pan and cook on a really low slow heat for 2-3 hours. Finally add a pinch of salt and the ground black pepper. Taste and add more seasoning to your liking. Bring a large pot of water to a rolling boil and salt generously. Add the pasta to the boiling water, stir to separate the noodles, and cover the pot. Drain the pasta in a colander set in the sink. Pour the pasta into a large bowl and spoon about two-thirds of the sauce over it. Gently toss the pasta and sauce to coat evenly. Add more sauce as needed. Serve immediately. I always had an obsession with the mob and reading Mario Puzo books when growing up! Too funny! This looks wonderful, my husband loves dishes like this too! Thanks for linking up at Try A Bite Tuesday Link Party! Hope to see you back next week! Pasta is a must when watching mob movies! This looks great! Haha. "Though not connected to the mob..." made me laugh. :D The sauce looks great and what a fun idea. Oh my gosh, this is brilliant!! I've never seen the movie but man, cutting garlic with a razor? That takes patience! Well, with my monthly food in movies challenge,you know I love this post. Great inspiration, and love the garlic pic! 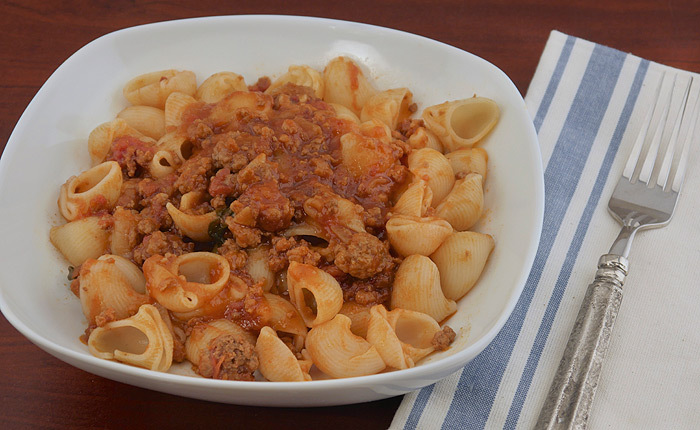 Love the combo of meats in this sauce, nice and hearty! I love a good pasta with a delicious sauce! Sounds delish! This sounds like a perfect evening in! A delicious dinner and a great movie! "Dinner In A Movie" is such an awesome idea! Love this pasta too! I could eat it for days ! I love that you used the blade to cut the garlic like in the movie haha! recipe looks so yummy! How fun to create a recipe for a movie...it looks wonderful. This recipe has my name all over it. I love the thinly sliced garlic. Fun theme you've started. Perfect recipe to go w/ the movie. Last year we attended a special event dinner/movie and Goodfellas was the movie. This definitely just brought me back to that event. I need to re watch GoodFellas, this pasta sauce sounds delicious! I used to belong to a book club with the same idea! So fun and wow, your pasta dish looks fantastic! These pasta look so perfect. It is classic comfort food. What a great idea to recreate a dinner from a movie! 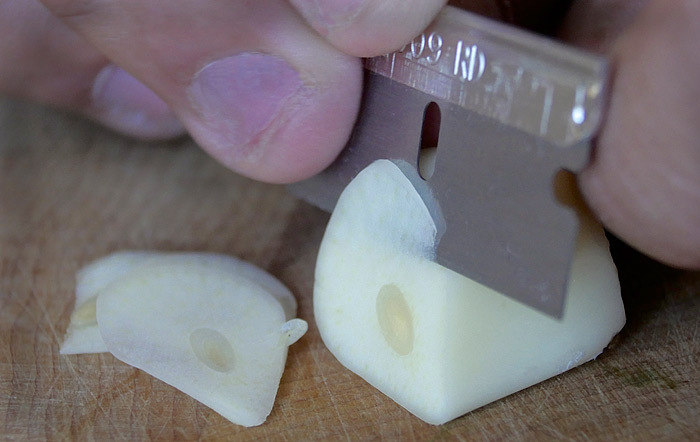 And what a handy way to slice garlic. This looks like the ultimate comfort food. Haha! The slicing of the garlic is SO Goodfella's! My husband has watched that movie 100 times! "Funny how...what do I amuse you?" And pasta....perfect! Loving your theme, super fun!! Your pasta recipe sounds terrific too, pure comfort!